Microsoft "This book will challenge you to ask and answer what arguably are the most important questions an executive can ponder today. So open up." Noah Kerner CEO, Noise and coauthor,Chasing Cool More and more companies are coming to understand the competitive advantage offered by outstanding design. With this, you can create products, services, and experiences that truly matter to your customers'lives and thereby drive powerful, sustainable improvements in business performance. But delivering great designs is not easy. Many companies accomplish it once, or twice; few do it consistently. The secret: building a truly design-driven business, in which design is central to everything you do.Do You Matter?shows how to do precisely that. 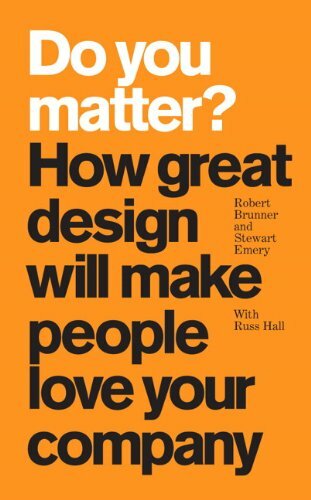 Legendary industrial designer Robert Brunner (who laid the groundwork for Apple's brilliant design language) and Stewart Emery (Success Built to Last) begin by making an incontrovertible case for the power of design in making emotional connections, deepening relationships, and strengthening brands. You'll learn what it really means to be "design-driven" and how that translates into action at Nike, Apple, BMW and IKEA. You'll learn design-driven techniques for managing your entire experience chain; define effective design strategies and languages; and learn how to manage design from the top, encouraging "risky" design innovations that lead to entirely new markets. The authors show how (and how not) to use research; how to extend design values into marketing, manufacturing, and beyond; and how to keep building on your progress, truly "baking" design into all your processes and culture.